Shikha as the Show Host in Dubai for this Hollywood Movie Launch, 'He's BACK'. A film by Cheetah Yajnesh Shetty & inspired from Bruce Lee. The way she TALKS is nothing but ACE. What an awe moment for Shikha hosting the Miss Universe 2000 herself, Lara Dutta! Shikha seen hosting one of the highest ranked Men's Badminton players in the world. He's Padmashri Srikanth Kidambi. Microphone duties for Shikha for State Bank of India, The Law Point & Rotary Club Of Bombay at the Insolvency & Bankruptcy Code Seminar 2018 at the Taj Mahal Palace in Mumbai. Precisely when Shikha was hosting and revelling with her audience at the Live In Concert of the Baby Doll of the Industry, KANIKA KAPOOR. An event executed by Shobiz for HPE in Goa. Shikha hosts the Annual R & R Ceremony for State Bank of India General Insurance, 3rd time in a row. Shikha hosts the wave of Digital Technology in Vishakhapatnam for Indian Express. 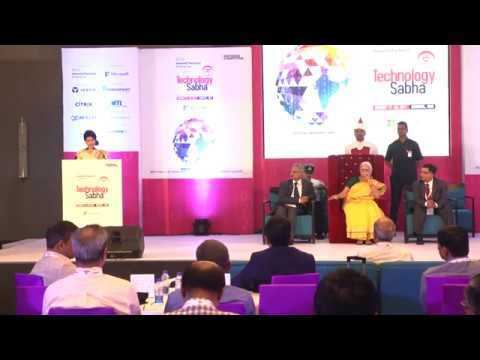 The premier platform of Technology Sabha for raising the bar for e-governance. With her at the centre stage of your show, you'll experience the connect! After all, it is the connect that she lives for. Shikha moderating the Pharma Packaging & Labelling Conclave at Novotel, Hyderabad. An event by Express Pharma.